OddBlob is a claymation arcade game. 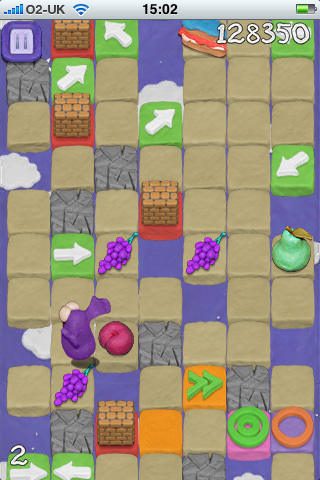 The object of the game is to bounce from end of a tile map to the other. Along the way there will be fruit and slices of cake that you can pick up for extra points. When you land on a slice of cake you will be taken to “bonus” round. There you will have to strategize a way of getting a slice of cake with the most combo moves to it. Be careful while jumping your way across the tiles. Some tiles will disappear on you. There are other tiles that will help or hurt you during the process. Arrows will cause you to jump in the direction they are facing. Double arrows will cause you to jump two tiles in the direction it is pointing. The target looking tiles will cause you to jump in the direction you are pointing at the time of landing on it. The game is neat. I like the concept, and the graphics are really good. The soundtrack gives a good feel to the game. I can’t say that about the sound effects. My only problem was the if I wasn’t precise in the direction of the jump I would accidentally jump to the side. I have big fingers. The game has an overall good feel to it, and I enjoyed my time playing it.